The way we make and drink tea in England is ever evolving and changing. From a posh afternoon tea using a fine bone china teapot and strainer to the development of the teabag. 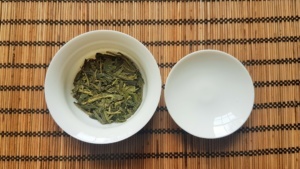 Knowledge of other teas is growing and with it comes a desire to learn more about the countries they come from and the tea drinking cultures that they are connected to. The origins of tea can be found in China and this is where the Gaiwan comes from. Created during the Ming Dynasty (1368-1644AD), it serves as one of the oldest tea making devices to date and little has changed in the design over time. They are considered a testament to elegant design combining simplicity, practicality, functionality and beauty. Gaiwans were made in a variety of different materials from porcelain to clay and even to jade. Making them from porcelain offered versatility as it does not hold any scents or flavours and so allows the drinker to choose from the various types of tea available. 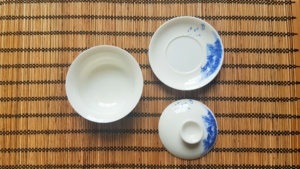 Gaiwan is made from three parts: a bowl, a lid and a saucer. 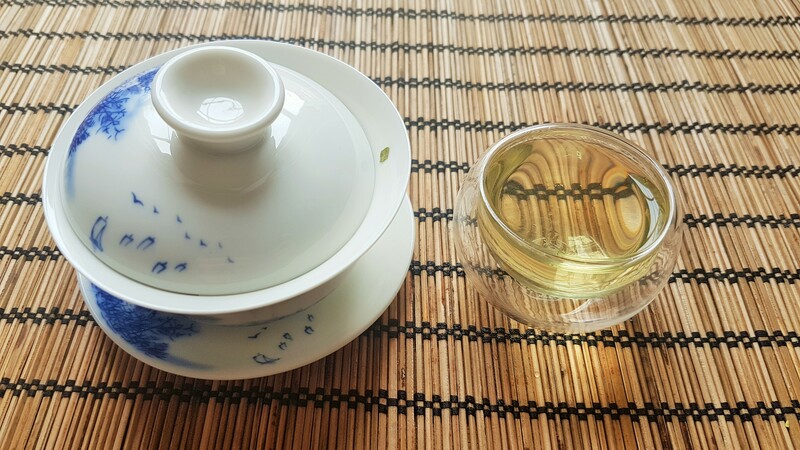 The design of Gaiwan is based on the writings of tea Master Lu Yu, who wrote extensively about, not only, the best ways to brew tea, but also about tea etiquette and tea equipment. 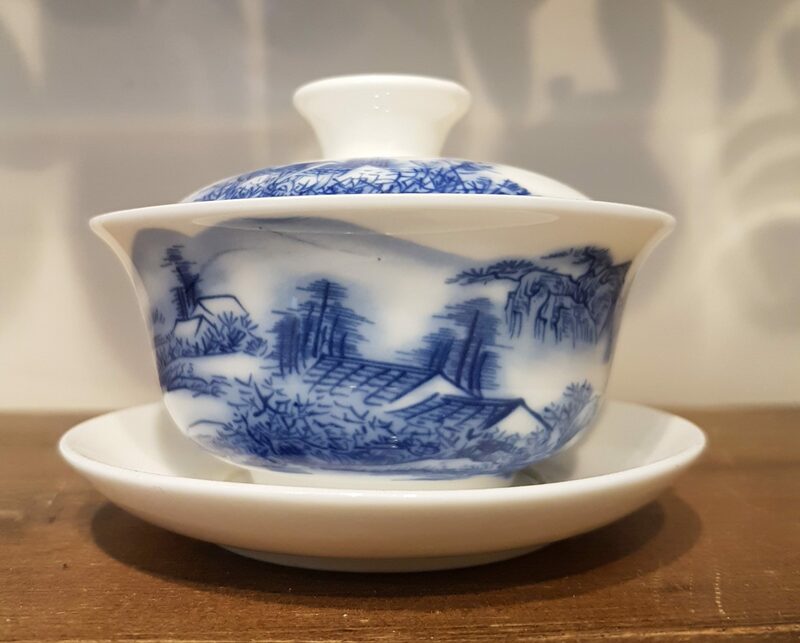 He wrote that a bowl had to be large enough to accommodate the implements and actions of tea brewing, though compact enough to be held comfortably in the hands for consumption. Gaiwan simply translates to “Lidded Bowl” or “Lidded Cup” depending on how you write it. 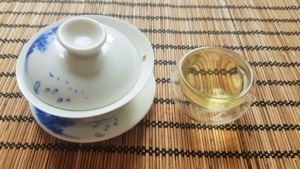 A Gaiwan normally comes with a cup, a saucer and a lid. The tea is brewed within the cup and is then either drunk directly from the Gawain or poured into a separate cup. Fill your Gaiwan about 2/3rds full of tea. For the demonstration we’ve used our Lung Ching Green Tea. Add water to your leaves and discard the first infusion. This is known as rinsing the leaves and designed to ‘wake up’ the leaves and begin releasing their flavour. As Gaiwans are quite small they are used to make multiple infusions. Brewing times are typically short given the high volume of tea used. The first few infusions will be very short – between 10-20 seconds with subsequent infusions lasting a bit longer. Lung Ching brewing after first infusion. Once brewed you can either drink it straight from the Gaiwan using the lid to keep the leaves within or it can be poured into a separate cup (as shown in the photo below). Pick up your Gaiwan with your preferred hand by placing your thumb on the top of the lid and sliding your hand underneath either the cup or the saucer depending on how hot your cup is. Slid the lid back so that your tea can escape, but none of the leaves can follow. Once brewed you can pour your tea into a separate bowl or cup. 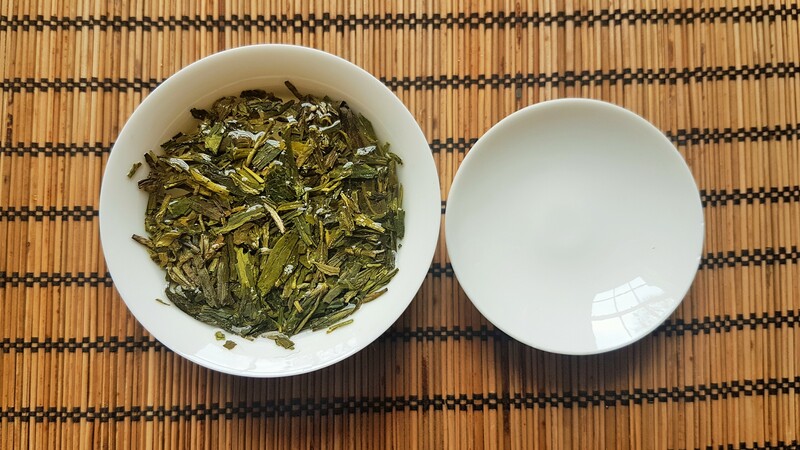 This way of brewing tea is especially good when using Green teas, Oolongs, white teas and Pu-erh. The multiple short infusions give the drinker the chance to fully experience what the tea has to offer. Each infusion will give a different depth of flavour, tasting notes and strengths. You can still brew other teas using this method.